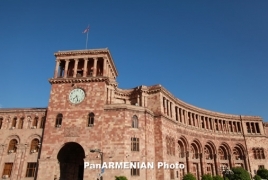 PanARMENIAN.Net - On September 11, the Armenian National Committee – Western Region’s California Legislative and Trade Trip Delegation met with Armenian Prime Minister Nikol Pashinyan. The delegation consisting of senators, assemblymembers, and representatives of IT companies expressed their gratitude for the opportunity to meet and explained the possibilities of future collaboration through educational institutions, IT companies, and trade through enhanced cooperation between California and Armenia, especially within the growing and vibrant IT sector. During the meeting with Prime Minister Pashinyan, ANCA-WR Chair Nora Hovsepian expressed gratitude for the government’s willingness to embrace and include the Armenian Diaspora in the advancement of the New Armenia and voiced the organization’s intent to continue to allocate resources toward the advancement of Armenia by bringing American delegations of policy makers and business representatives to facilitate collaborative efforts. Prime Minister Pashinyan welcomed the ideas of the delegation and assured his willingness to work with the leaders of California through the state legislature, the Glendale City Council, and the ANCA-Western Region. Some of the matters discussed during the meeting included direct flights between Los Angeles and Yerevan, building partnerships between the IT sectors in California and Armenia, and how to legislate tax incentives to encourage investment and start-ups in Armenia.